Recently I’ve been in transit and surrounded by boxes a lot – I’ve moved away from a place where very dear people passed by my door quite often and sometimes stopped to eat. Important meals took place in the bungalow in south London where I lived for 2 years. A breakfast of watermelon, walnuts, honey, yogurt, Turkish pastries and boiled eggs; pork loin and chickpeas with aioli; tomatoes stuffed with veal and tarragon; fresh greengages and cheese. I am still mourning the departure of this place from my life. I am hopeful about meals of the future in my new location – but they haven’t happened yet! A big thing I miss is the joyful and intense focus of planning a menu for very dear people, a way of communicating the particular regard I have for them. How perfect, for the cusp of winter and spring to feast on vegetables from either side of equinox, a little bitter-sweetness and a little newborn green and pink. First, I found an Italian deli that sells small packets of homemade dried pasta and a few vegetables out the front. I bought spinach pasta gnochetti sardi – a very small dried shell-like pasta from Sardinia. I overheard a conversation about Sardinia between the owner and a customer, who was, sadly for him (according to the woman running the shop) visiting the wrong side of the island for her to recommend him places to eat. To that, I added some salted capers, black olives, a lemon, a head of purple radicchio and a perfectly fat bulb of garlic. I asked after artichokes – the woman said that fresh, they were not to be found in York, but that I might try the market along the road. At the market no artichokes could be found, but there was a bulb of fennel, some thick new English asparagus spears, an orange, pink Yorkshire rhubarb and a bunch of dark green mint. Later at the supermarket, hazelnuts, bread, sugar and Alpro soya yogurt. I gleefully noted the presence of various Italian pasticceria and cafés in York town centre as I made my way round. I settled for a rather elegant place with a scoop of Sicilian pistachio ice cream garnished with a wafer and two whole pistachios, an espresso and a glass of water and set to planning the menu I would make. Trim the base of one head of radicchio a little, then cut it into around 8 wedges – cut in half first, then into quarters, and then halve the quarters again. Drizzle each cut half with olive oil and season with salt and pepper and place under a hot grill. Wait until it smells a little smoky and the leaves are browning and then turn. When the leaves are browned on both sides remove them to a plate. Segment the orange: cut off the base and the top of the orange. Then cut down the sides of the orange removing the peel and pith with a sharp knife. Make your way round the orange like this until there’s no pith and peel left. Then cut into each segment between the skin to extract the segments, free of pith and chewy skin. Cut a red onion in half, and slice one half very thinly. To make a dressing, mix a small squeeze of lemon and any juice left in orange peelings, with 2 tablespoons of olive oil and salt and pepper. Gently toss the dressing with the radicchio, onion and orange on a plate. Garnish with hazelnuts that you’ve lightly toasted in a hot dry pan – being careful they don’t burn. Slice the fennel bulb lengthways into thin-ish pieces. Trim off any bad or browned bits. Boil for 5 minutes in salted water. 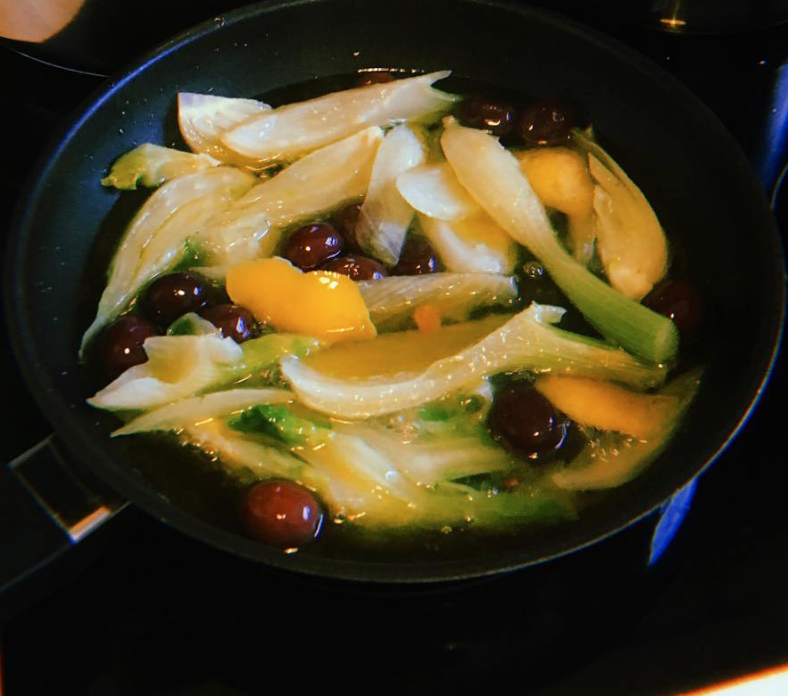 Drain then place in a frying pan with 8 tablespoons of olive oil, a handful of black olives (kalamata), a piece of lemon peel and 1/2 cup of water from the kettle. Simmer on a low heat, just about bubbling, for 45 minutes. Season with salt and pepper before serving. Place 1 large clove of garlic cut into small pieces in a frying pan with 5 tablespoons of olive oil. Turn the heat on low, and fry gently for 30 seconds. Add in two tablespoons of capers – rinsed of salt or brine – and fry gently for 5 minutes. Then add some pieces of finely chopped lemon rind and cook for another couple of minutes and turn off the heat. Meanwhile, boil water for the pasta with a good amount of salt in (a tablespoon). Cook until al dente, just a little chewy. Before draining, take out 1/2 cup of cooking water. Drain the pasta. Squeeze the juice of 1/2 lemon into the caper mix and toss a little to emulsify. Add in the pasta to the frying pan and a few tablespoons of the pasta water and salt (not too much, as the capers are very salty and a grind of black pepper). Toss the pan to coat the pasta, use a spoon to help if you need. Then add a little more of the cooking water and toss again. Serve immediately.